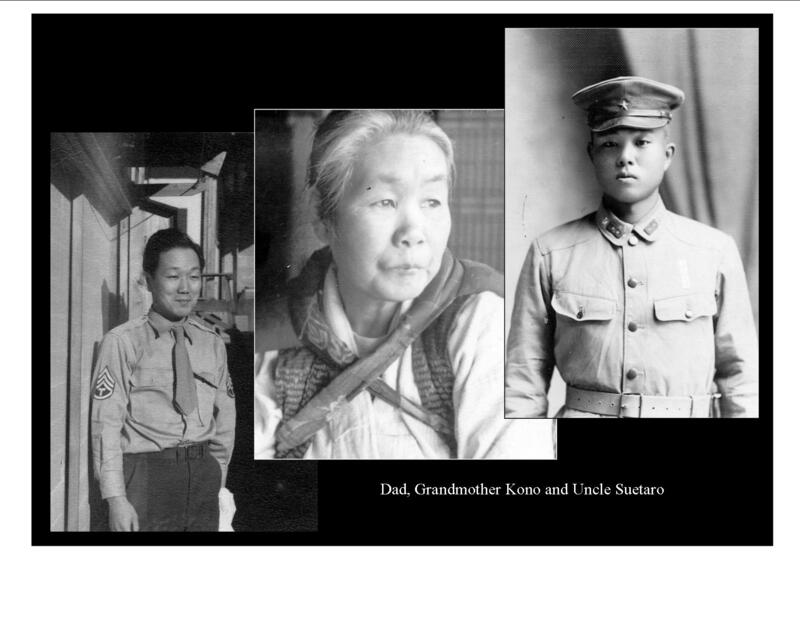 Grandmother Kono, flanked by my dad on the left and his younger brother Suetaro on the right. As we readied for Day 3 of our pilgrimage, the fate of my Seattle-born Uncle Suetaro became even more haunting. 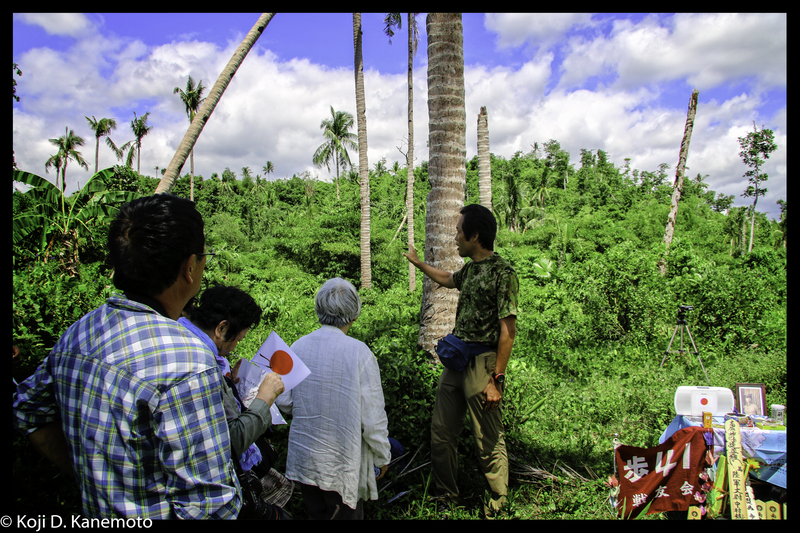 From my study of the Battle of Leyte and from now standing on its very soil, the enormity of doom that hovered unbeknownst over Uncle Suetaro became very clear. Vastly outnumbered by the Allied invasion forces and out-supplied, only 20 young men out of the 2,550 in his Hiroshima-based 41st Infantry Regiment would ever leave Leyte. The remains of the 2,530 soldiers are still there. 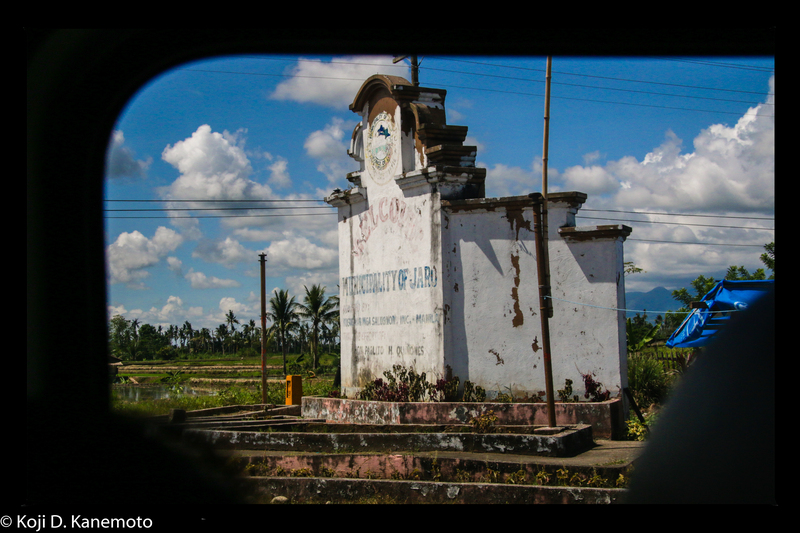 After the first memorial service and just north of Jaro, off to the west of the road that runs up to Carigara Bay. The low lying hills behind us is from where Col. Newman’s column came under fire from my uncle’s IJA’s 41st Regiment on November 1, 1944. The same torch-like sun greeted us once again in the morning as we gathered for Day 3 of our pilgrimage. Today promised to hold the biggest emotional impact of our journey: we will be actually tracing the footsteps of our Uncle Suetaro. Due to high costs, I was unable to use my smartphone’s GPS nor Google maps to track our movements nor mark our coordinates; as such, we came upon the bridge without notice…but we had indeed arrived. The remnants of the Mainit River Bridge of 1944. As we got out of the vans, it firmly struck me that we were in audience of my uncle’s past footsteps… The footsteps of the uncle I never had the chance to meet because of war. Our paths had finally crossed. 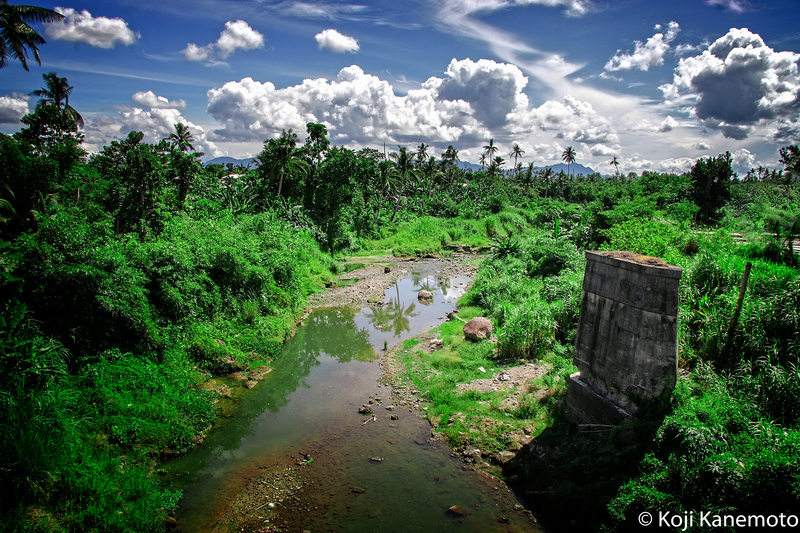 In 1944, it was referred to as the Mainit River Bridge; its remnant was right in front of us. We stood on its replacement bridge about 50 yards away, with heavy traffic rushing by, barely passing us on the narrow walkway. The original steel bridge spanned from right to left in the above picture. A dark weight bore down on me as I stared at the single concrete column. Like on some of the walls and fences at Normandy, it was pot-marked with bullet holes and artillery damage from that day. I could hear the gunfire, the artillery, the whump of mortar rounds hitting their targets and the desperate screams of young men dying. My skin – even in 90F weather and covered with sweat – got goosebumps and my eyes teared up. This is where I believe my uncle met his likely death… on the left side of the river and above centerline in the picture. According to Mr. Ota’s book, my uncle’s lieutenant in charge of the 37mm anti-tank guns, Lt. Shiduoka, was killed; in addition, over 1,000 Japanese soldiers died between October 30th and November 1st. Although the bridge was rigged with explosive charges but sadly for the Japanese Army, the combat engineer was killed before he could set off them off. The bridge was left intact. On the other hand, it was good for our US Army as essential Sherman tanks and self-propelled howitzers could now traverse the muddy river to engage the enemy. I can “feel” both sides of the battle. Victory and defeat. Perhaps that is a curse. I offered gassho, the Buddhist way of prayer, to all those young men – especially to Uncle Suetaro – while on that bridge, quivering with the weight of the traffic lumbering over it. Anguish filled my chest as tears filled my eyes. I wonder how my dad or grandmother would have reacted if they had seen it. If Uncle Suetaro had survived the combat, we followed the road towards the west (see map above); it was the same road they would have retreated on – albeit dirt or mud the evening of October 30, 1944. 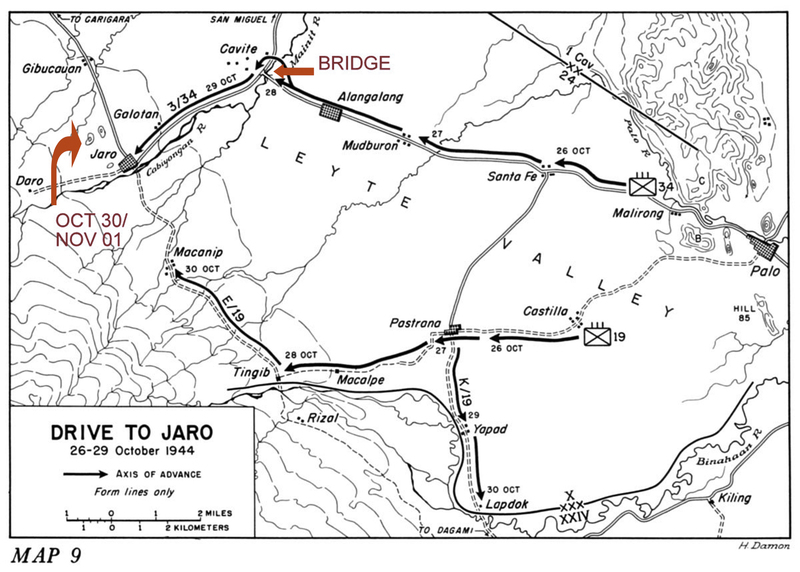 We then entered the town of Jaro. We then turned north towards Carigara Bay but stopped after about a kilometer. (See red arrow in battle map above.) I didn’t know why until we started to get out. We were to conduct our first official memorial service of this pilgrimage at this spot. Believe me that the memorial service in and of itself worried me as I am not Japanese. I am American. 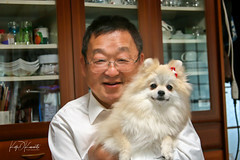 Japanese pay attention to minute actions; acting in one way may be harmonious, another way very rude and unacceptable. 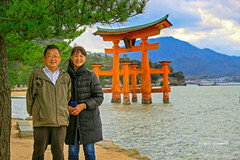 And it is true: a Japanese man can come to America and become American… but an American can go and live out the rest of his life in Japan and never become Japanese. Although I was born in Japan, the latter is me. This US Army photo was indicated as taken at Jaro, Leyte. This could very well be close to where we stopped but regardless, it should give you an idea of what our US soldiers saw – very heavy forestation in stifling humidity. We had stopped on a narrow two lane street, across from a small dwelling filled with a number of children. As we left the coolness of the van, the sweltering heat greeted us once again. Mr. Ota explained that just beyond our view from the road was the low-lying hills on which the 41st Regiment had hidden themselves and fired upon the tanks and Col. Newman on November 1.¹ And he was right: Col. Newman would not have been able to see the low-lying hills, especially since the vegetation would have been much thicker on November 1, 1944 (see photo above). The Japanese Army selected their defensive position well. Our party assembled their articles to be carried to the memorial service location: photographs, food, cigarette packs, water, incense and osake. Things that a young Japanese soldier longed for out on the battlefield. Mr. Ota’s young, tall son Daichi lugged along a small side table for us in this heat. My guess is we walked inland about a quarter of a mile from the dwelling. We stopped at the base of the low-lying hill, now clearly visible in front of us. Mr. Ota explaining to us about the low hills not visible from the road and from which a Japanese 37mm anti-tank round entered through the barrel of an American Sherman M4 tank. Uncle Suetaro was a sergeant in command of a 37mm anti-tank gun crew. Palm fronds were swaying in a consistent but warm breeze and ground cover would crackle as we stepped upon them. But in drastic contrast to explosions caused by US 105mm howitzer shells exploding or the sound of Japanese Nambu machine guns blasting away 71 years ago, some birds were joyously singing about us. Perhaps they knew why we were there – for peace and remembrance. Masako offering her gassho and incense. 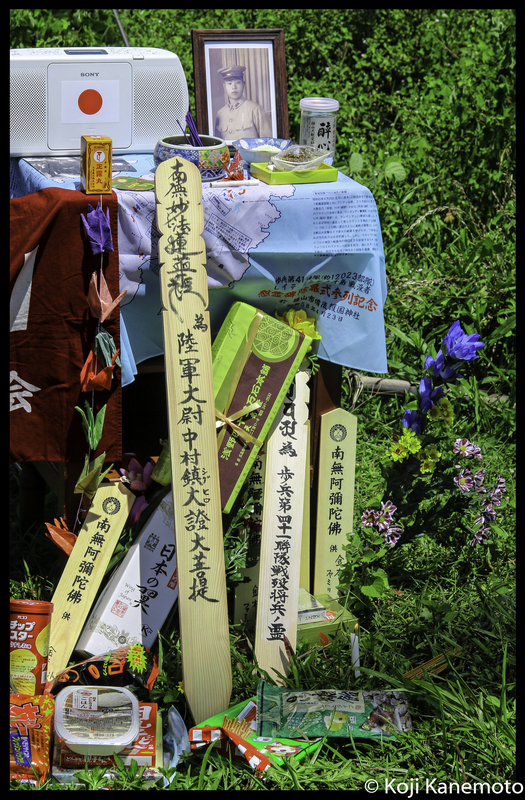 While many tried to shield themselves from the searing sun by standing in the little shade that was available, the folks meticulously placed their offerings and remembrances of family. The memorial table still in the midst of preparation. 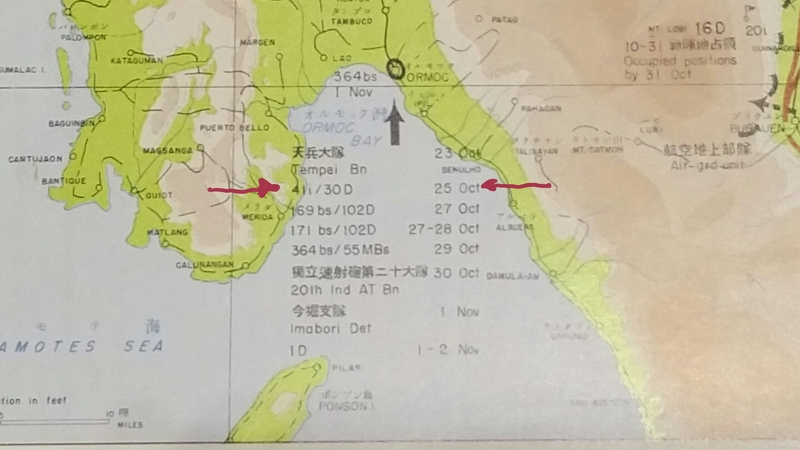 Mr. Ota had the blue cloth designed for the memorial; there is a map of Leyte along with main battle sites. The wooden boards are called TOHBA (塔婆) I believe; some will have five notches designating five-tiered pagodas. Some believe them to function as antennae, a way of calling the souls back. There was a first time for everything. This service was going to be definitely mystifying for me. And I could see Mr. Ota went though a lot of trouble so that we would have a memorable service filled with honor, release of grief and closure. He did the planning and preparation on his own; we didn’t have to ask him. 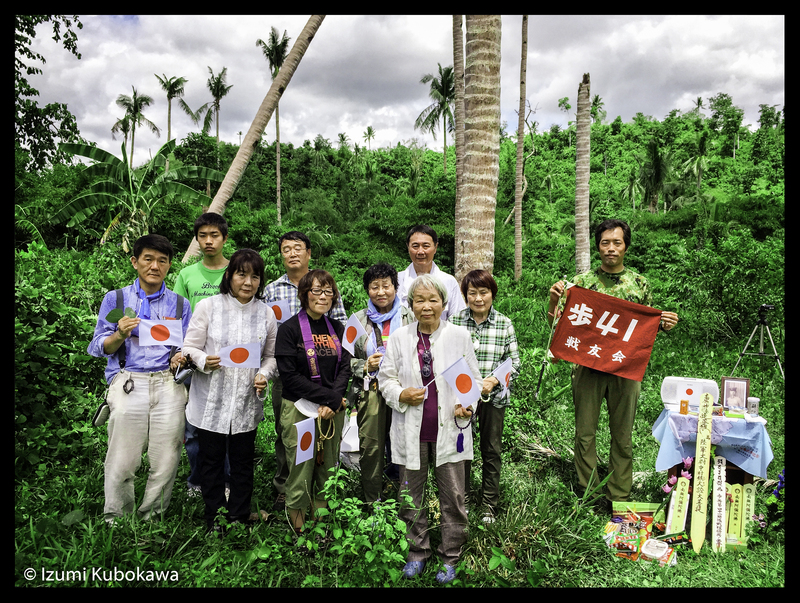 My very amateurishly shortened and edited video is below, including a portion of Masako reading her poignant yet touching letter to her Uncle Suetaro who, for us, was still somewhere in the low lying hills in front of us. You had sent me postcards from your station in the Far East, showing pictures of the local children. They are still forever etched in my heart. On this land upon which I stand now, Uncle, you fought courageously though you were so very hungry and exhausted. 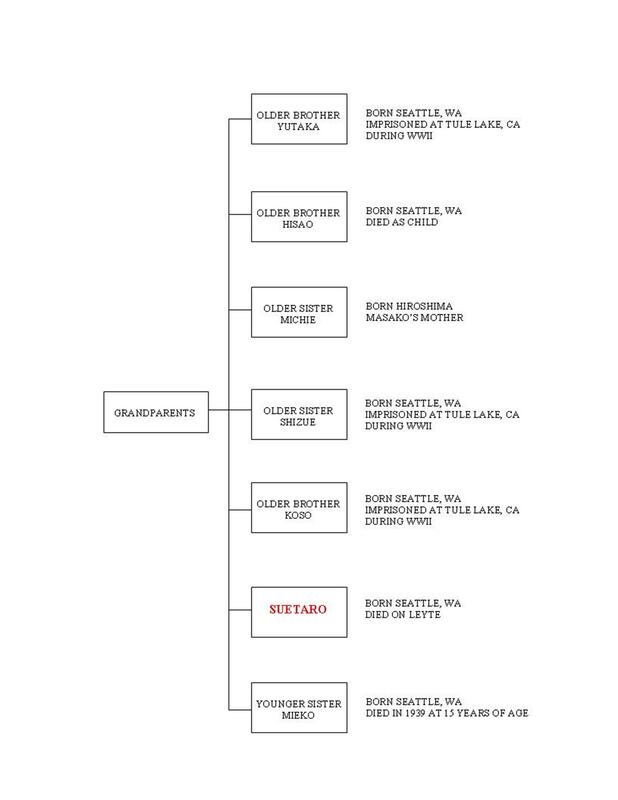 After the war ended, your oldest brother Yutaka² came back from America and officially adopted me into the Kanemoto family. On February 8, 1954, your mother Kono took her last breath while her head was resting in my arms. I have raised two children and as if destiny, I have resolutely carried on the family name on your behalf. There wasn’t a dry eye. I think even the birds were crying. It is believed I occupy a potentially unique position when it comes to looking at history as it pertains to the Pacific Theater in World War II. I am American first and foremost and have studied WWII history out of curiosity. As expressed in the description of my blog, my viewpoint is from “one war, two countries, one family”. However, one potential uniqueness is that I am able to read a bit of Japanese; you may be amazed to read what is written about WWII from the Japanese viewpoint of history. As such, I believe each battle will have in the background two broad, driving and dissimilar viewpoints: one from America and one from Japan. The attack on Pearl Harbor is one example. But that is but the surface on war’s history – a high altitude view. One that can be easily manipulated politically. But being on the ground dealing in face to face combat – or interrogation – leaves little to interpretation. However, the fog of time challenges what is seen in a veteran’s mind. Many of us here in the US interested in this world-wide cataclysm believe the Japanese soldier was a fanatic… freely willing to give his life for the Emperor. The banzai charges. The kamikaze attacks. Individual soldiers throwing themselves under tanks with an explosive charge strapped onto their backs in a suicide attack. The truth of the matter is… they were farm boys. City boys. Just like our boys, they were drafted. Instead of dying in “banzai attacks”, these “fanatical” Japanese soldiers wanted to go home just like our boys…but they couldn’t for fear of reprisal against their families. Being a buck private in the Japanese army was brutal. Perhaps not as brutal as the treatment they gave POWs but brutal nonetheless. My Uncle warned his brother-in-law of that brutality in his farewell letter written on May 3, 1944. Excerpt from “Intelligence Bulletin, G-2 USAFPOA, Feb 1945”. The translation was performed by a Nisei in the Military Intelligence Service. 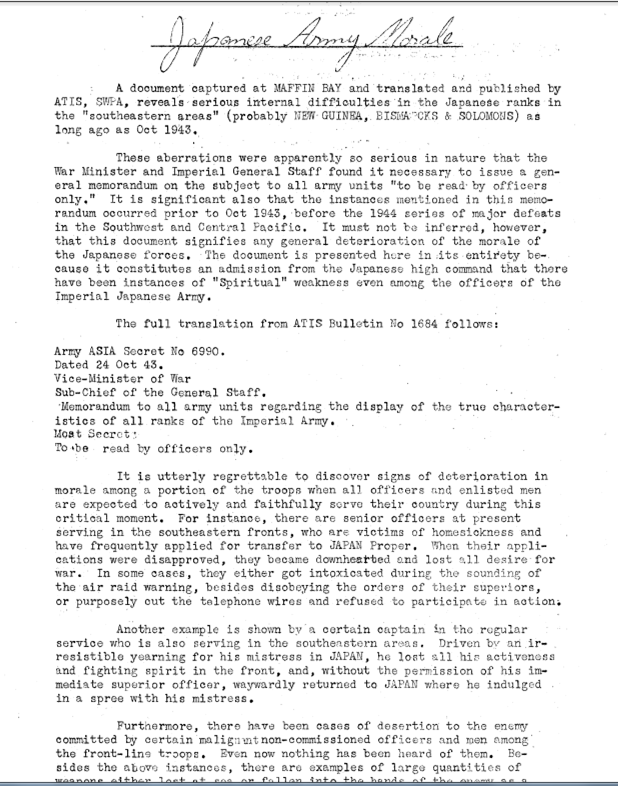 The captured Japanese document was dated October 24, 1943. So perhaps things are not what they seem? I wonder how my Uncle Suetaro felt. The 41st Regiment, and therefore Uncle Suetaro, was stationed in Pyongyang, Korea in May, 1944 per Mr. Ota’s book. It had become absorbed by the Imperial Japanese Army’s 30th Division. After sunset on May 8, 1944, the 41st Regiment boarded a steam locomotive bound for Pusan. After one day’s ride, they arrived in Pusan on May 9 at 4:00 PM. All 5,000 troops soon began to cram onto a ship called the 日昌丸 (Nissho Maru) with a capacity of 3,000 troops… in addition to supplies and their backpacks. American intelligence reports indicate temperatures could rise to 120F within the holds. 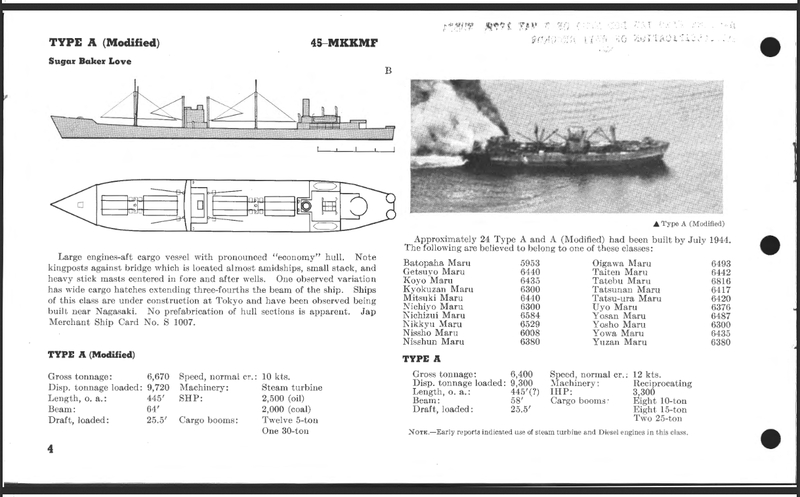 The Nissho Maru is listed in this WWII era Division of Naval Intelligence report. Per Mr. Ota’s reconstruction, the Nissho Maru departed Pusan on May 10 as part of a Imperial Japanese Navy fleet convoy. At about 3 PM the next day, the convoy docked in Moji Port in Kyushu, Japan to take on more supplies and hook up with other transports. During this time, their destination was disclosed: Mindanao. I am sure thoughts of seeing his mother was enveloping his mind…and heart. Hiroshima was not far away. In the early dawn hours of May 13, the convoy – now consisting of eleven transports and four destroyer escorts, departed Moji Port. They were vigilant against US submarines and proceeded at best possible speed. They docked at Manila during the evening of the 18th. The troops were already plagued with severe cases of sweat rash. Soon, the 1st and 2nd Battalions on board the Nissho Maru headed to Cagayan with the 3rd Battalion and headquarters staff headed to Surigao on board the Tamatsu Maru. Because they were splitting up and therefore would be separated from their regimental colors, the commanding officers boarded the Nissho Maru on the 19th as a send off. They reached their destinations on the 23rd. Soon, they were engaging Filipino guerrillas and they were extracting their toll on Uncle Suetaro’s regiment. Per Mr. Ota, Captain Okamoto, a combat veteran from New Guinea was killed. 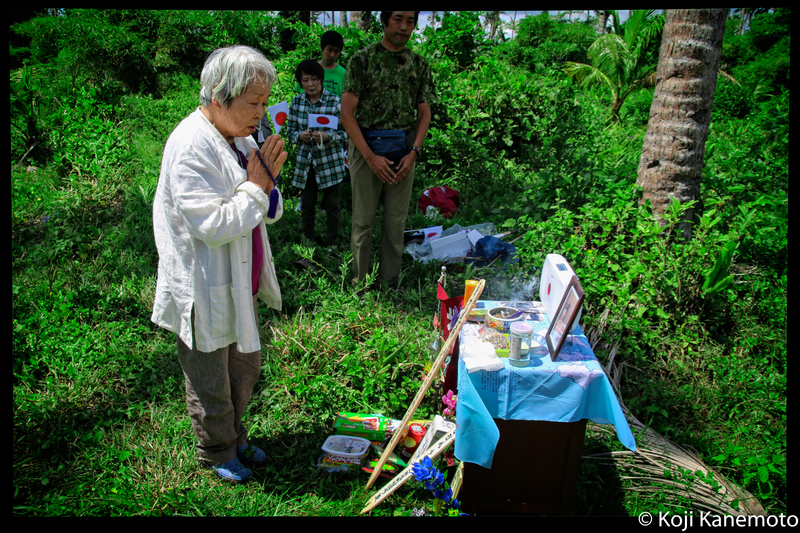 On July 10, Captain Ozaki, commanding officer of the 2nd Batallion, was also killed. Short on officers, Captain Masaoka was appointed commanding officer of the remaining troops, numbering about 1,000. 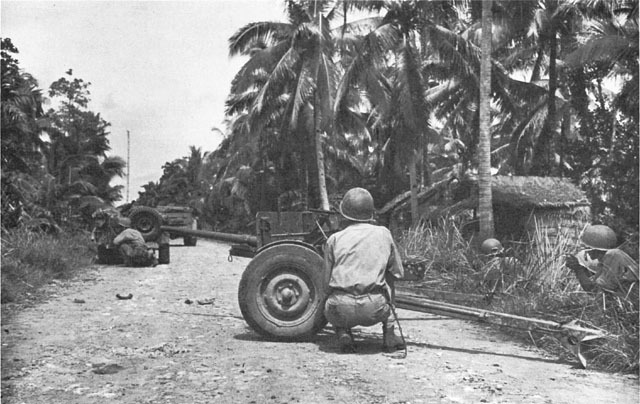 From “Leyte”, US Army publication. General Yamashita was caught flat-footed. He had anticipated MacArthur would invade Luzon first. He had to scramble. In fact, the invasion’s advance was so rapid that MacArthur made his walk onto the Leyte beach a “Hollywood-esque” event on the first day. Yes, he actually had several takes done of wading ashore being the media seeker he was but it is true there was gunfire off in the distance. Fortunately for our troops, the Japanese had withdrawn her troops from shoreline defensive posts. Even though there had been up to four hours of bombardment by the USN of the shore defenses, many fortifications – including pillboxes – were untouched per an A-Day communication to General Hap Arnold of the USAAF from General Kenney. He concluded there would have been a blood bath similar to Tarawa if the Japanese hadn’t withdrawn. 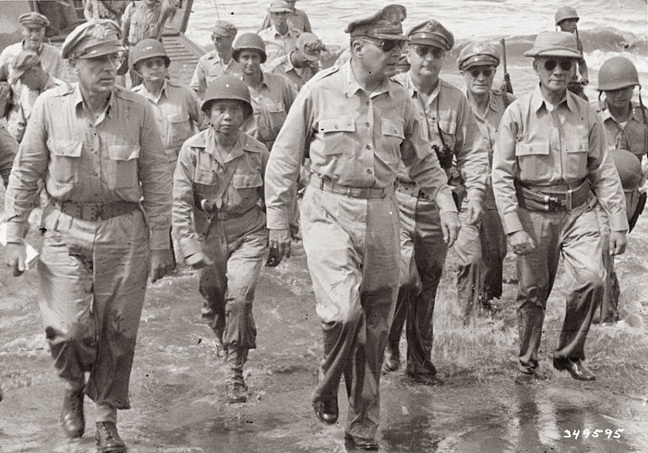 MacArthur pompously wading ashore on Leyte on October 20, 1944. He would shortly broadcast that speech where he says, “I have returned.” National Archive photo. 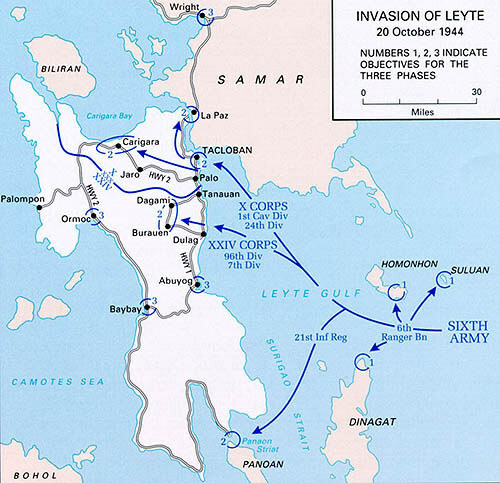 The first major coordinated Japanese Army troop movements (i.e., reinforcements) to Leyte involved troop transports, joined by units of Cruiser Division 16 out of Manila. The objective was to transport about 2,550 soldiers (count per Mr. Ota) of the 41st Regiment from Cagayan, on Mindanao, to Ormoc. Named Convoy TA 1 by the USN, it included heavy cruiser Aoba, light cruiser Kinu, Uranami, three new T.1-class transports (T.6, T.9, and T.10), and two new T.101-class transports, (T.101 and T.102). They were to be led by Rear Admiral Sakonju Naomasa in the Aoba but she had been torpedoed two days earlier by the USS Bream. The flag had been transferred to Kinu. This convoy picked up the surviving 1st and 2nd Battalion members of the 30th Division at Cagayan, Mindanao on October 25th and arrived at Ormoc. Fortunately, the Division had been alerted the day before so they were ready. Uncle Suetaro had apparently been in the the 3rd Echelon, 1st wave of five transports that disembarked on the 26th in Ormoc. Source: Reports of General MacArthur.